Elite Stat: Brady’s passer rating under pressure against the Saints was a perfect 158.3. Tom Brady put his Week 1 performance behind him with a near flawless display against a hapless New Orleans defense that didn’t make it much of a challenge. Brady’s numbers across the board were excellent and he completed nine of 13 pass attempts ten or more yards down field. Brady had three passes dropped, so his numbers could have looked even better. Elite Stat: Anderson broke seven total tackles on 28 touches between carries and receptions. This was a reminder that a fully-healthy C.J. Anderson is a monster for the Denver Broncos, and he gashed the Dallas defense this week, gaining 85 of his 118 yards after contact, breaking six tackles along the way from 25 carries. Anderson also caught every pass thrown his way, scoring a touchdown in the process. Elite Stat: Jones was second among WRs with 4.0 yards per route run. Elite Stat: Crabtree led all receivers with 4.44 yards per route run. Michael Crabtree had a near perfect outing against the Jets, catching every pass thrown his way for 80 yards and three scores, giving Derek Carr a perfect passer rating when throwing in his direction, Crabtree beat four different Jets defenders for catches. Elite Stat: Gronkowski led all TEs with 4.0 yards per route run, the most among TEs with more than 10 routes run. Perhaps the most typical Rob Gronkowski game imaginable, the Patriots star TE went to work on the New Orleans secondary, racking up 116 yards, 59 of which came after the catch, only to then be forced from the game with a groin injury. Gronkowski was a devastating force as a receiver, and with just 15 run blocking snaps in the game, had little chance to display his skills in that area. Elite Stat: The WR rating when throwing to Allen was 108.3, the fourth best among WRs this week. With six different Dolphins beaten for catches, Keenan Allen caught nine of the ten passes thrown his way for 100 yards, 44 of which came after the catch. Allen did the majority of his damage over the middle, with 37 of his yards coming against LB Kiko Alonso alone. Elite Stat: Thomas allowed one total pressure on 50 pass blocking snaps. Joe Thomas hit the milestone of 10,000 consecutive snaps played since entering the league in 2007. He celebrated by once again locking down his side of the line, surrendering just one total pressure despite 50 pass blocking snaps and two different quarterbacks behind him. Thomas remains the benchmark for elite left tackle play and shows no signs of slowing down. Elite Stat: Osemele allowed just one hurry across 28 pass blocking snaps. Kelechi Osemele set about destroying the defensive front of the New York Jets this week in the run game, but he was near perfect as a pass blocker too, surrendering just one hurry on the day. Jets defenders were running down field to avoid taking on his block, and he was moving bodies on the line too for the Raiders run game. Elite Stat: Mack had a perfect day in pass protection against the Packers. 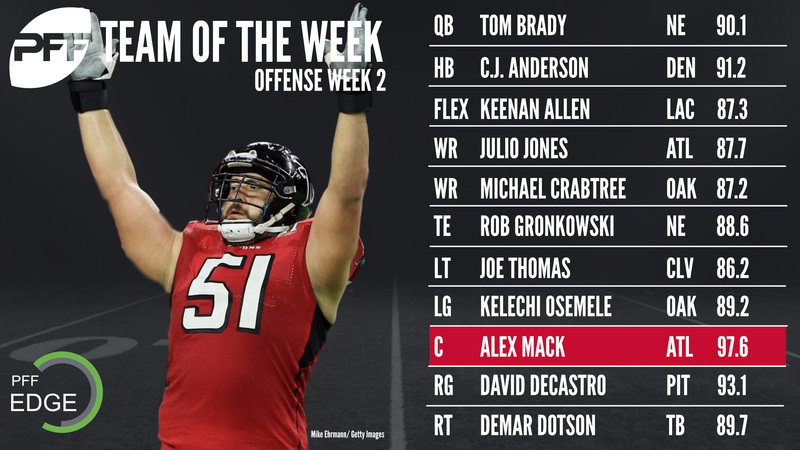 Alex Mack makes the team of the week for the second consecutive round of games, and this week is named PFF’s offensive player of the week for his performance against the Packers. Mack didn’t allow a single pressure across 32 pass blocking snaps , but it was his work in the run game springing Falcons backs on zone runs that was his most masterful work. Elite Stat: DeCastro allowed just one hurry from 37 pass blocking snaps. When David DeCastro is at his best, it’s his work in the run game that really shines through, and that was the case in this game. Multiple times in the game, DeCastro got to the second level to take Vikings LB Eric Kendricks for a ride, but he also did damage against the rotation defensive line bodies inside, like Shamar Stephenson and Tom Johnson. While the rest of the Bucs offensive line struggled, RT Demar Dotson was excellent. He didn’t allow any pressure across 35 snaps of pass protection, but also had a strong day in the run game against a formidable Chicago defensive front. This was one of the strongest games of Dotson’s career. Going up against the Houston Texans offensive line will help make any defensive lineman look good, and Geno Atkins was a human highlight reel back on Thursday night. He notched two sacks, a hit and three hurries, and levelled Texans QB Deshaun Watson a couple of times. Atkins was also a force in the run game, using his quickness and leverage advantage to knife through the Houston line and blow up plays in the backfield. Another player to see a boost thanks to facing a poor offensive line, DeForest Buckner tore the Seahawks offense to ribbons. Though he didn’t have a sack, he did take down Russell Wilson four times on hits and had five additional hurries to lead all defensive interior players in total pressures this week. Elite Stat: Miller led all players this week with 12 total pressures. It may not have shown up in sacks until late in the game, but Von Miller was destroying Cowboys RT La’el Collins all afternoon. He ended the game with 12 total pressures, the most of anybody this week, and it could have been more had he not jumped offside four times in the game trying to time the snap count. Miller also got his hand to tip the final pass of the game, deflecting it into the arms of Aqib Talib for an interception. Elite Stat: Lawrence had five total pressures from 23 pass rushing snaps. The Broncos defeat of the Cowboys featured a host of excellent edge rusher performances, and Shaquil Barrett could easily have made the team too given how he took it to LT Tyron Smith, but DeMarcus Lawrence had himself an outing. Lawrence had a sack, hit and three hurries as well as notching four defensive stops over the course of 45 snaps. Elite Stat: David allowed 0.67 yards per coverage snap this week against the Bears. This was a vintage display from Bucs LB Lavonte David, showing well in coverage and run defense. Overall he led the team with five defensive stops, which is two more than any other Tampa defender, and in coverage he allowed just 18 yards from the five catches he allowed, keeping everything in front of him well. Elite Stat: Davis allowed eight catches on nine targets, but they went for a total of just 38 yards. Thomas Davis led the Panthers this week with six defensive stops, three times as many as any of their other linebackers and two more than any other defender. He was his usual impressive self in coverage, allowing three catches from four targets, but they went for a total of just 11 yards. Elite Stat: Melvin was thrown at eight times, allowing just three catches against the Cardinals. Thrown at eight times in the game, Rashaan Melvin allowed just three receptions against the Cardinals. He blanked Larry Fitzgerald on two targets and held Jaron Brown to one catch for nine yards while breaking up two passes on the four targets that went his way. Elite Stat: McCourty was thrown at five times, but allowed just one catch for seven yards. Jason McCourty had one of his best games in years for the Browns against the Ravens this week. He was thrown at five times but allowed just one catch for seven yards, while picking off a pass and breaking another up. Elite Stat: Joseph notched four total pressures, the most among any safety this week. 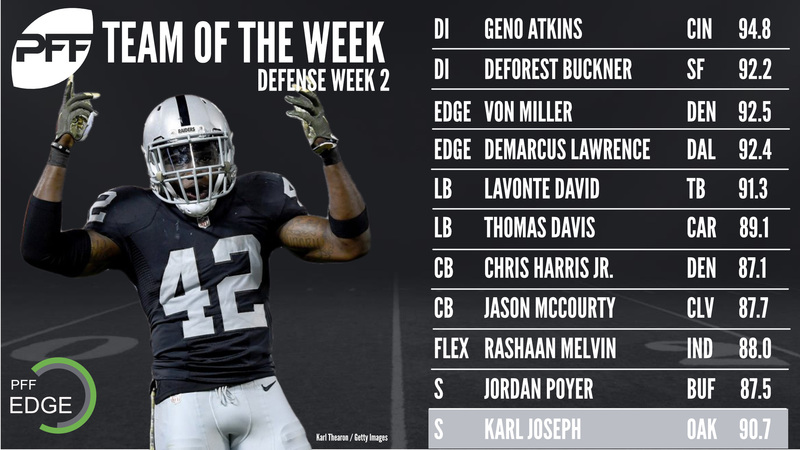 Karl Joseph continued his strong start to the season, grading well in run defense against the Jets, and racking up four defensive stops over the game. He also blitzed six times, collecting a sack and three additional hurries on those rushes. Elite Stat: Poyer had a perfect tackling efficiency score, missing no tackles on eight total attempts. One of the early surprises of the 2017 season, Joran Poyer makes the team of the week for the second game running. Poyer broke up two passes in the game despite only being the primary coverage defender for one, and notched a sack on just two pass rushing plays on the blitz. Elite Stat: Harris Jr. allowed one reception on 47 coverage snaps in the slot this week, the best rate in the league. The Denver defense was lights out against the Cowboys, and Chris Harris was on his best form along with the majority of the unit. Harris was thrown at seven times, allowing just two catches for 20 yards while breaking two of the incompletions up and intercepting a pass on a deflection from Cowboys WR Dez Bryant. Parkey was perfect on the day, going 4-for-4 including one from 50+ yards helping the Dolphins pick up a win in their first game of the season. Solid on kickoffs too, he helped push the Chargers back to an average start of the 20 yard line. The rookie played a huge role for the Colts’ special teams on Sunday, averaging 42.4 net yards per punt. Just one of his seven punts were returned, with three landing inside the Cardinals 20 yard line. Only one player has scored a touchdown on a punt or kick returner through the opening two weeks of the season, so he was an easy choice for the Team of the Week here. He returned three punts on the night, with his 88 yarder sealing the game for the Lions.